Actress Priyanka Chopra has been chosen as one of the actors to announce the list of nominations for the upcoming 90th Academy Awards. Michelle Rodriguez, Rebel Wilson, Michelle Yeoh, Rosario Dawson, are some of the other Hollywood bigwigs, who will do the honours on January 23. 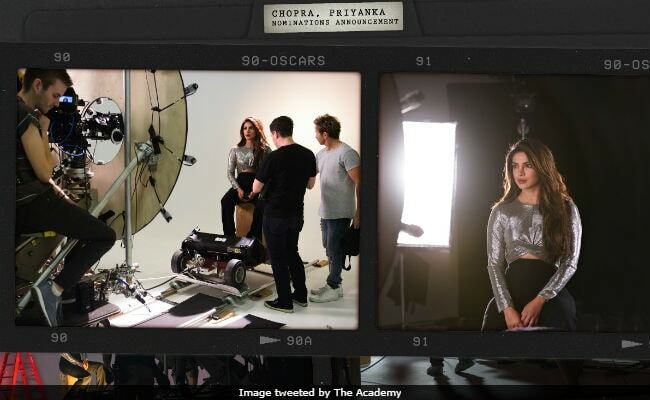 The announcement came from the official Twitter handle of the Academy Awards - "Behind the scenes with @priyankachopra. Tune in to the #OscarNoms announcement on Tuesday at 5:22 am PT." Last year, at the 89th Academy Awards, Priyanka Chopra walked the red carpet in white Zuhair Murad gown. The Academy's Instagram handle also posted a series of 'behind-the-scenes of #OscarNoms' photos, one of which shows Priyanka Chopra dressed in a silver blouse and high-waist wide leg black trousers. Last year's Oscar nominations were announced in a unique manner - through sketches - and this year, the Academy is taking it up one level ahead. The 90th Academy Awards have roped in Hollywood stars to announce the list. If rumours are to be believed then we might even see Priyanka Chopra walking up on stage at the 90th Academy Awards as one of the presenters. Priyanka Chopra is not new to the International award show scenario. Though she gave the Golden Globes a miss this year, she has earlier presented awards at the Emmys in 2016 and in 2017 and Golden Globes in 2016. She has twice won the People's Choice Award for her role in Quantico. The aforementioned photo-series also features Rosario Dawson, who is almost unrecognizable, along with Rebel Wilson and Michelle Rodriguez. On Tuesday, Michelle Rodriguez will help introduce this year's #OscarNoms. The 90th Academy Awards will be held in Hollywood on March 4, 2018, and Jimmy Kimmel has been roped in yet again to host the awards night, after last year's impressive show. Priyanka Chopra, 35, is currently busy shooting for season 3 of Quantico. She will be seen reprising the role of Alex Parrish, an FBI recruit-turned-CIA agent. She was last seen in Hollywood film Baywatch while her last Bollywood appearance was in Prakash Jha-directed Jai Gangaajal (2016).